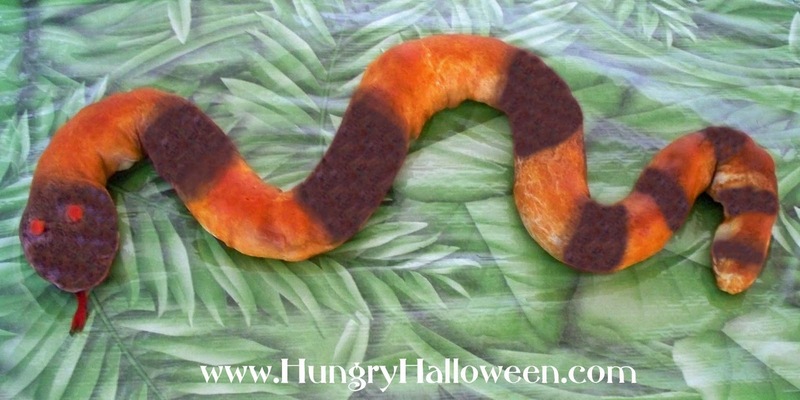 Click here to see the instructions for making this Slithering Snack Snack. this is unreal!! So scary/cute at the same time. Another great idea Beth! So, so , so cute! I'm amazed! I love your ideas! My son's birthday falls on Halloween, and I'm always looking for cool things to do. Your site takes the cake, so to speak! Made this for a party last night and it was a huge hit. I think next time I may try to put cheese in it! I'm so happy to hear that you made this recipe and that it was a huge hit. If you use cheese, put it on in the last few minutes of baking or it will either melt off or get crusty. I'm glad to hear the food coloring worked well. Happy Halloween. Made two slithering snakes for my daughter's halloween-themed 4th b'day party - the kids and adults loved it! Then I made it again the following night for dinner when her cousin came over - again, kids loved it! Can't believe how life-like it came out. My nephew even said "I never ate snake before!" lol!! (I used fresh red pepper for mouth/eyes - worked out beautifully!) Thanks for the recipe!! So happy to hear you had such success making this recipe. Would love to see pictures if you took any. Happy Halloween!